Bike path will connect Overton Park to the Shelby Farms Greenline. Currently, cyclists traveling from Overton Park to the Shelby Farms Greenline must contend with crossing busy Sam Cooper Boulevard in two places, dodging vehicular traffic along Tillman and Broad, and even off-road biking through the east side of Overton Park. 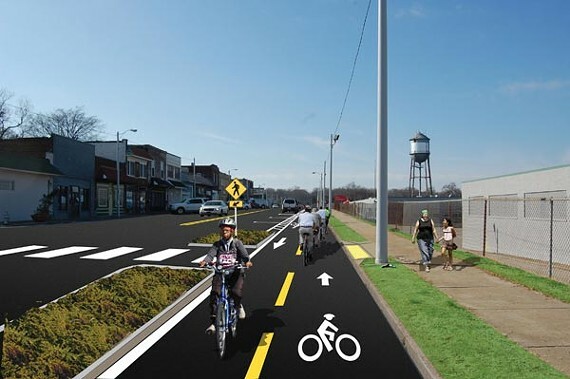 But at a public meeting at Caritas Village on Saturday, Livable Memphis unveiled a proposal for a two-lane bike path leading from Overton Park to the trailhead of the greenline that would alleviate all of those problems. "When you're going from Overton Park to the Shelby Farms Greenline, you will feel like you're on something that is a true extension of the greenline," said John Lawrence, acting director of Livable Memphis. While the bike lanes proposed for Madison and Cooper in Midtown are split on either side of the road, this plan calls for a "cycle track," a two-way bike path on one side of the street that is double the width of a normal one-lane bike path. The track would be buffered from traffic by landscaped areas in some places and parking in others. "Where the track crosses driveways or streets, the path is highlighted so cyclists know to be aware of cars," said Steve Auterman, an urban designer for Looney Ricks Kiss, the local firm working on the project in partnership with national greenway designers Alta + Greenways. The bike path would begin on the east side of Overton Park and connect with the paved service roads that wind around the park. Currently, cyclists must ride over grass to reach the traffic crossing at Sam Cooper, but that area would be paved. The path would then cross Sam Cooper, where traffic signals would likely have an all-red option allowing cyclists to safely cross. Cyclists would then take the existing sidewalk down Sam Cooper to connect to the cycle track that begins on the north side of Broad Avenue. Currently, the stretch of Broad that runs past the Broad Avenue Arts District has bike lanes on either side, but the existing lane on the south side would be removed. From there the path remains on the north side until it reaches Lester Street, where the track crosses Broad and begins again on the south side of Broad. The path turns onto Tillman and remains on the west side of the road until it reaches the trailhead of the Shelby Farms Greenline. The cycle track stretches nearly two miles. At a moderate pace, a cyclist could reach the greenline from Overton Park in about 15 minutes. "We really wanted to go down Tillman because it connects with ball fields, basketball courts, a police station, a community center, and the Urban Farms Market," Lawrence said. "The design that we're hopeful about accomplishes all of that." Applications have been made for funding to pay for the cycle track striping, and Auterman said that part of the project should begin in about six months. The landscaped buffers would be costlier and likely added after more funding is available. "Right now, we don't even have estimates of what this will cost. We have general estimates, but we need the construction documents and engineering to get very specific about what this will cost and where the money will come from," Lawrence said. Although the city engineer's office has been involved from an advisory standpoint, Lawrence said funding for the initial design and construction-document phase for the Overton-Broad Connector is a private endeavor. "This is all from private donations and philanthropic funding to get us to the point where we have something the city can take and fund through multiple sources," Lawrence said. "That's much like how the Shelby Farms Greenline worked."